Clay Soils - Accu-Pier Foundation Repair LLC. We use a proven chemical that is an ion exchanger and reduces expansive soils up to 75%. This chemical changes the clay to a non-crystalline structure by substantially reducing the negative charge of the clay. As a result water intake is reduced and the clay cannot swell after treatment. The chemical reaction to the soil is irreversible making the effects permanent. Our chemical injection process is 50% or more, faster and utilizes approximately 50% less water than other conventional methods such as water or lime injection. Our chemical solution has been in production and used in many countries since its inception in 1990. The original use for this chemical was for roads and building pads when good soils were not available. This method was generally done with a water truck or water wagon mixed with layers of soil and compacted in lifts. Our chemical process is now used in a variety of applications. Injection is the most cost effective way to stabilize the soil without any or very little excavation, and has been proven to strengthen soils 40-60% verses untreated soil. Highly expansive soils can be reduced to a PVR of 1-2" in most cases. Engineers will normally require less than 1% swell. Chemical Soil Stabilizor is reliable, safe to use, guaranteed, and eco-friendly. Our chemists have been diligent to create a soil stabilizing formula that is non-harmful to the environment. Most soil stabilizers have an acid that will burn a person's skin upon contact. This chemical will not burn the skin and can be washed with water and mild soap. This product is landscape friendly and minimally invasive making it the perfect solution for existing homes and buildings with expensive landscaping or concrete around the slab. Many homes need some piering to correct excessive settlement. Once those piers are installed, the home can be treated with our soil stabilization and help prevent further settling of the home. This product can also be used before you build, to stabilize the soil before the foundation pad is ever built. We inject the ion exchanger into the soil around and under the foundation beam. 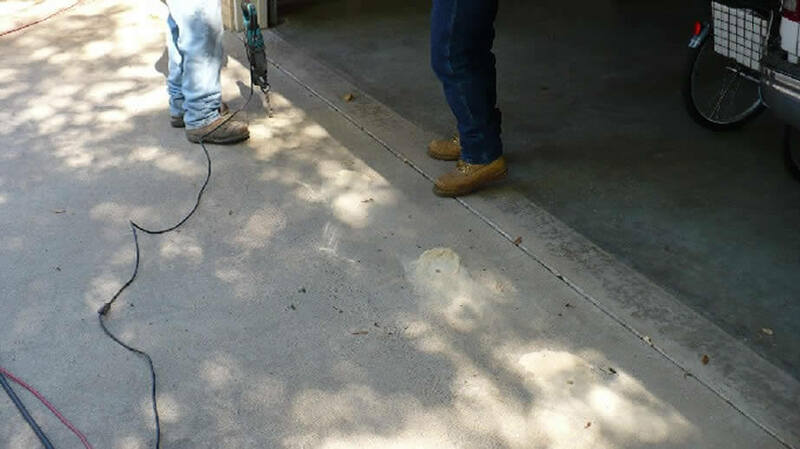 We drill holes in driveways or patios as needed every 2' to inject the ion exchanger under the actual foundation beam. 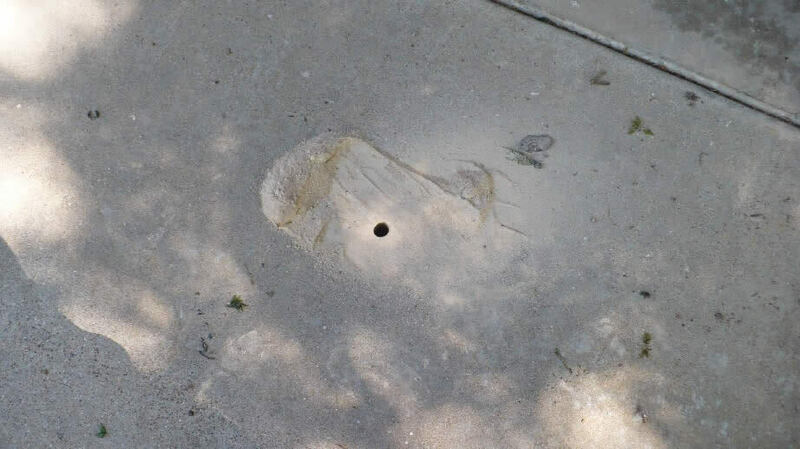 After the injection process is finished, we fill the hole with concrete patch. A home's foundation is in direct contact with the ground and joins the building's structure with the underlying zone of soil or rock. The foundation's job is to transfer the structure's load to the underlying soil or rock, without excessive settlement or movement. Movement of the soil beneath a home can severely damage the foundation. That’s why the soil beneath your home is often referred to as your second foundation. 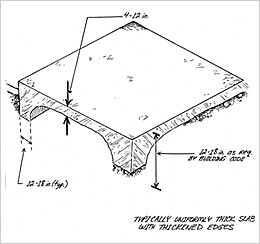 Slab-on-grade foundations are shallow foundations that are most often constructed of reinforced concrete. Slab-on-grade foundations can be built quickly and are relatively inexpensive to build. The function of a slab-on-grade foundation is not to resist or limit the amount of heave that might occur beneath a slab foundation, but to move up and down with the shrink and heave. Slab-on-grade houses do not have basements. Shallow foundations are susceptible to seasonal movement from rainfall, drought, freeze/thaw cycles, and temperature changes and transpiration of moisture thru the roots of large plants and trees. Pier and beam foundations Pier and beam foundations, as the name suggests, are a concrete footing and pier which supports wood beams and floor joists. These foundations usually have crawl spaces underneath the home. Basements are most often constructed in northern climates where freeze/thaw conditions occur and the footing depth must extend beneath the frost line—often four or more feet below the surface. In many of these cases, builders will go ahead and excavate for a basement and build basement walls that provide the support for the house. The bottom of the basement is typically below the depth over which the majority of the soil’s shrink or swell due to climate occurs. Basements can suffer basement floor heave and lateral wall movement, however. Deep foundations reach depths that are not normally affected by seasonal environmental changes and are considered to be out of the zone of influence. There are a multitude of other types of both shallow and deep foundations. Soils with the potential to shrink or swell are found throughout the United States. Soils with this shrink/swell potential create difficult performance problems for buildings constructed on these soils. As the soil water content increases, the soil swells and heaves upward. As the soil water content decreases, the soil shrinks and the ground surface recedes and pulls away from the foundation. These problems are of particular concern in homes with shallow foundations. See Foundation Basics. Homes are normally not built in areas where the soil conditions are perfect. The developer selects land for various reasons, which may include availability, cost, proximity to industrial areas, and proximity to schools. The main reason for selecting a parcel to develop, of course, is that there is a strong demand of people who want to buy homes in that area and a profit can be made from selling the homes. The best way to find out if the soil beneath your house is expansive is to ask a geotechnical engineer. In many housing developments a Soils Report will have been prepared, but this requirement varies depending on the region of the country. A geotechnical engineer will make soil borings on your site and take samples so these soil samples can be tested for expansiveness. These samples will show how expansive the soil is and at what depths. The geotechnical engineer will provide a written report on his findings. What is the "active zone?" From the ground surface downward, there is a depth over which expansive soils experience a change in moisture conditions as the climate (or seasons) change. This results in the soils shrinking or heaving. This zone is an average of 18’ deep. A shallow foundation will be more impacted by soil and climate considerations than a deep foundation (see Foundation Basics for more information about shallow foundations). Expansive clays will swell/ heave when wet and contract/consolidate when dry. If the foundation system is in the active zone (a shallow foundation), the foundation will move as moisture conditions change in the active zone. Select fill is normally defined as a sandy loam that shows little change with moisture variations. A building pad properly built with select fill/loam will support the foundation. Problems could occur if erosion occurs that changes the bearing capacity of the soil. Sand will not change as moisture conditions change. However, sand can erode if drainage around the lot allows water to work its way under the foundation. Sand can also fall in a crack created by drying soils and cause the foundation to drift (move horizontally). Rock can erode and expand slightly only if it is a low density of shale. In some slope conditions, fractures/ faults in the rock can allow sliding and failure if not properly pinned with tie back anchors. When a structure is supported by various soil conditions, the house may move differentially. As an example, if one half of the foundation sits upon expansive clay and the other half bears on select fill and/or rock, the amount of seasonal movement will vary from one half to the other half. If the foundation system is not properly designed, the differential movement may cause damage to the foundation and structure. Many times building pads will be cut and/or filled so the bearing soil is all of the same type. The USDA Natural Resources Conservation Service, formerly the Soil Conservation Service, has been publishing soil surveys for 100 years. A soil survey contains maps and a description of each major soil in the survey area. USDA Service Centers are designed to be a single location where customers can access the services provided by the Farm Service Agency, Natural Resources Conservation Service, and the Rural Development agencies. This web site will provide the address of a USDA Service Center and other Agency offices in your area along with information on how to contact them. Having a home built? You may anticipate a few things going wrong, but you'd expect your builder to erect your house on solid ground, right? Don't be so sure. Population growth and urban sprawl mean there's not much residential land left in many areas. "What's left is not very good," says Daniel G. Knowler, a senior engagement manager at Navigant Consulting, which specializes in construction disputes. A lot of homes are being built on expansive soil — earth that swells when it rains — without adequate safeguards. In mid-1994, shortly after John Duffy and his family moved into their $234,000 home in Highlands Ranch, Colo., long cracks started showing up in the walls, and the porch started pulling away from the house. After badgering his builder for the soil report, Duffy learned his lot was a hot spot for potential swell. Writer Homes, the builder, was ordered to pay Duffy $544,000. John Palmeri, Writer's attorney, says the company offered to fix the Duffys' house, but "they were bent on going to court." Swelling soil isn't the only problem. In March 1998, four hillside homes built on the site of an ancient landslide in Laguna Niguel, Calif., toppled after the unstable soil gave way. Early in 1999, Capital Pacific Homes (which had bought the builder, J.M. Peters), the lot developer, the grading company and the engineering company that checked the soil agreed to pay about $35 million to the homeowners, the homeowners association and the people whose condos at the bottom of the slope were also destroyed, according to Andrew Kurz, the association's attorney. Capital Pacific declined to comment. We use a proven chemical that is an ion exchanger and reduces expansive soils up to 75%. This chemical changes the clay to a non-crystalline structure by substantially reducing the negative charge of the clay. As a result water intake is reduced and the clay cannot swell after treatment. 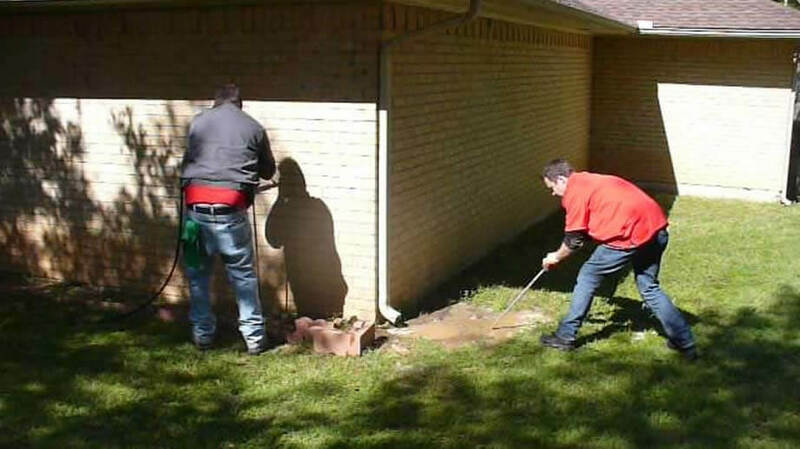 Here at Accu-Pier Foundation Repair we hope you will never need foundation repair. But if you do, we will do our very best to make the repairs quickly, efficiently and affordably. We know what a disruption and inconvenience this type of work can be, we strive to reduce the stress of having foundation repair work done. We have refined this method of foundation repair. Once your home is repaired using the Dual-Pier method it will Never need foundation piers again. Because your home is the single largest investment you will make in a lifetime, we want you to feel comfortable with having Accu-Pier Foundation Repair making the needed repairs to your foundation. You can rest assured that we are competent to handle anything that might come up during the repair process. Our crews are fully staffed and we contract with licensed plumbers and engineers when the job calls for it. We will fully explain our process and what you can expect during the repair work. We insure there is a supervisor who stays on the job during the entire process to make sure you are comfortable having someone you can talk to or ask questions. This is our business and providing you with peace of mind during your repair is our focus. We have trained representatives who evaluate your foundation needs at no charge. If that evaluation concludes that foundation repair of stabilization is needed we will recommend needed repairs to insure the integrity of your slab. We offer 3 types of foundation repair, dualpier, single pressed pier and steel pier. Our estimator will evaluate your particular situation and offer you a solution tailored to your specific needs. 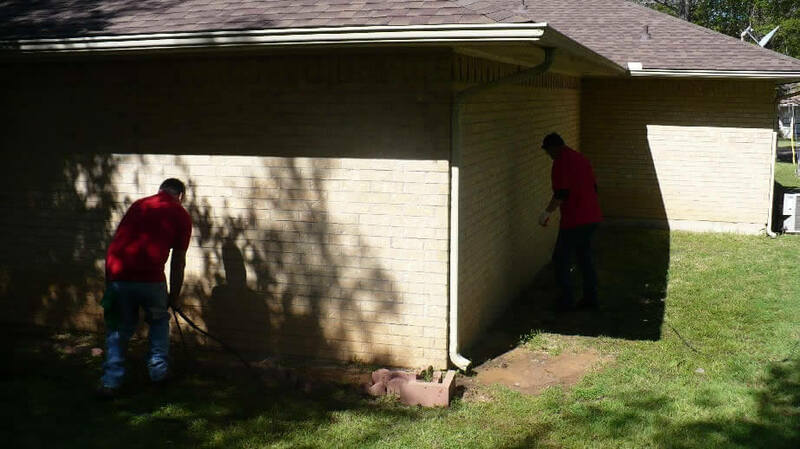 We inspect many homes that are experiencing foundation movement, but don't really need foundation repair. In these cases, soil stabilization is a good option to help keep the foundation from being so active, and help prevent future problems by stabilizing the soil before a serious problem arises. Click on the "Clay Soil" button in the left column, for more information. Accu-Pier Foundation Repair stands behind our work with a written lifetime warranty on all Pressed-Pier and Steel Pier repairs. This warranty is transferable to future owners. Our high standards, work ethic and integrity produce a real pride of workmanship.